Now you can add music and sound effects to enrich even your non-musical productions without worrying about copyright restrictions! Music enhances the perceived quality of all productions when added for scene changes, curtain calls, underscoring and more. Each themed CD can be used to meet your incidental music needs for any number of shows, and as a bonus, each CD also includes related sound effects. 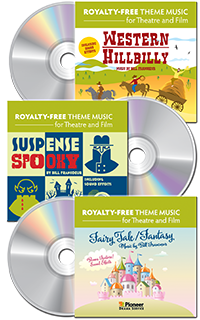 Imagine how your production will come to life with trumpet fanfares and waltz music from the Fairy Tale/Fantasy CD, an approaching stagecoach and hoedown music from the Western/Hillbilly CD, or thunder and mysterious music from the Suspense/Spooky CD! Read more...Ambient music brings your production to a new level as it quickly transports your audience to a village fair, a magic forest, a showdown at high noon, or a haunted mansion. With over 50 tracks on each CD, you can customize your own show soundtrack to meet the specific needs of each production. The best part? Purchasing the CD gives you unlimited rights to add this music to all your theatre performances, contest pieces, and film projects.